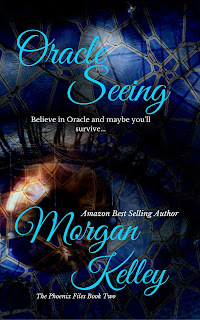 Next week Oracle is coming! It's a week until Oracle Seeing releases. I can't wait. Lucian and Bishop are two of my favorite characters. They rank right behind Elizabeth, Ethan, and Callen, and Greyson and Emma. I'm about to write the third book next week, and I'm contemplating keeping them. Yes, like a pet I found outside, I think i'm going to keep them in the series. I know right now you're thinking....'What is Morgan talking about?' Well, you'll find out next week on Friday when the book releases. As I was writing the story, I really felt like their story wasn't done. When I first wrote The Killing Times, it had a different ending. It ended with Ethan taking the job as sheriff of Salem and Elizabeth becoming mayor. It was meant to be a single book, a standalone. There was never meant to be an FBI series. As I wrote 'The End', something didn't feel right. It felt incomplete, so against best judgment (and some friends who told me I was crazy) I rewrote the ending. Ethan and Elizabeth had more story to tell. Well, that was 2013, and here we are, 3 years and 16 books later, and I have that same feeling. I have no clue, and sometimes, that's the best part of being a writer. You sit down, you start writing, and you let the story tell itself. I think this book will be my 45th novel. Honestly, I've lost count. It's been a fast three years of writing. Lucian and Bishop will have to take the lead on this one, and I trust them. It's their story to tell, and we're going to get to watch it unfold. I hope you can't wait either. Here is the link to the kindle pre-order.